Am I the only one who doesn't feel like doing much of anything in the garden in August? Where I live the air is hot and clammy, the rain keeps falling, and the mosquitoes are on steroids. Both the garden and this gardener are drooping and tired. But on dry days I put on the bug spray and head out, because I know whatever I do now will save time later and allow me to enjoy a neater, prettier fall garden. Weeding, deadheading and container maintenance top my to-do list. And I find that once I get myself outside, I hit my stride and gardening becomes the joyous and relaxing activity it otherwise is. 1. Deadhead selectively. Many plants, like coreopsis, look better with their faded flowers removed. Lilies should be deadheaded to keep them from going to seed which draws energy from the bulb (leave the foliage until it yellows, however). And unless they have hips, roses should be deadheaded now. Others, like hydrangea, give the winter garden interest and texture for months. 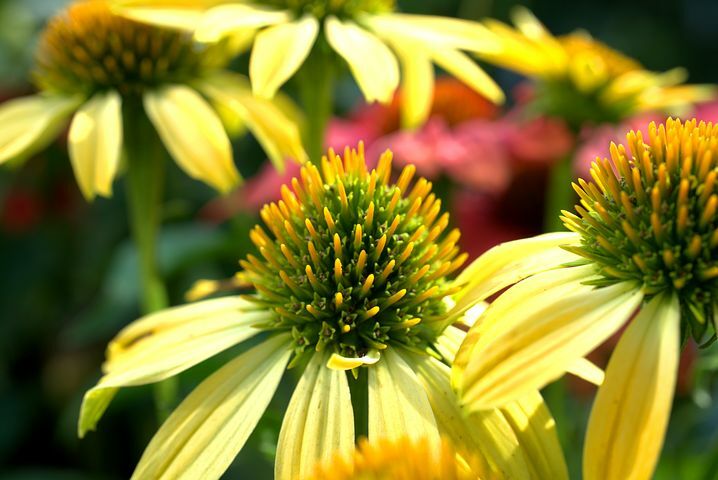 Coneflower and black-eyed Susan not only look good in winter but provide seedheads for birds and other creatures at a time when they need to put on weight for the cold weather to come. Let annual flowers like cosmos self-sow for blooms next year. 2. Stay on top of the pests. Caterpillars and beetles are chewing their way through gardens at this point. Handpick them off prized vegetables and ornamentals, or cover with floating row covers. Row covers will also work for beetles. Aphids are still active, too. Horticultural oil spray or killing them with your fingers (wear gloves) works. 3. Spruce up containers. Snip off dead or diseased leaves and flowers, clean debris off foliage and out of pots, look for and treat for insects. Every few days, rotate containers a quarter-turn to expose all areas of the plants to sunlight. Wipe dried soil and detritus off the pots. 4. Start switching out containers with fall-blooming plants. 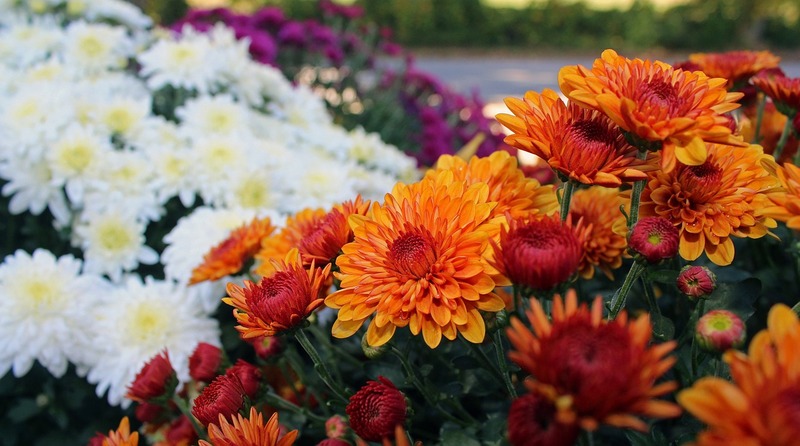 Flowers such as pansies, mums, asters and other cool-weather-loving plants are beginning to show up on garden center shelves. Buy now for the healthiest plants and greatest selection. 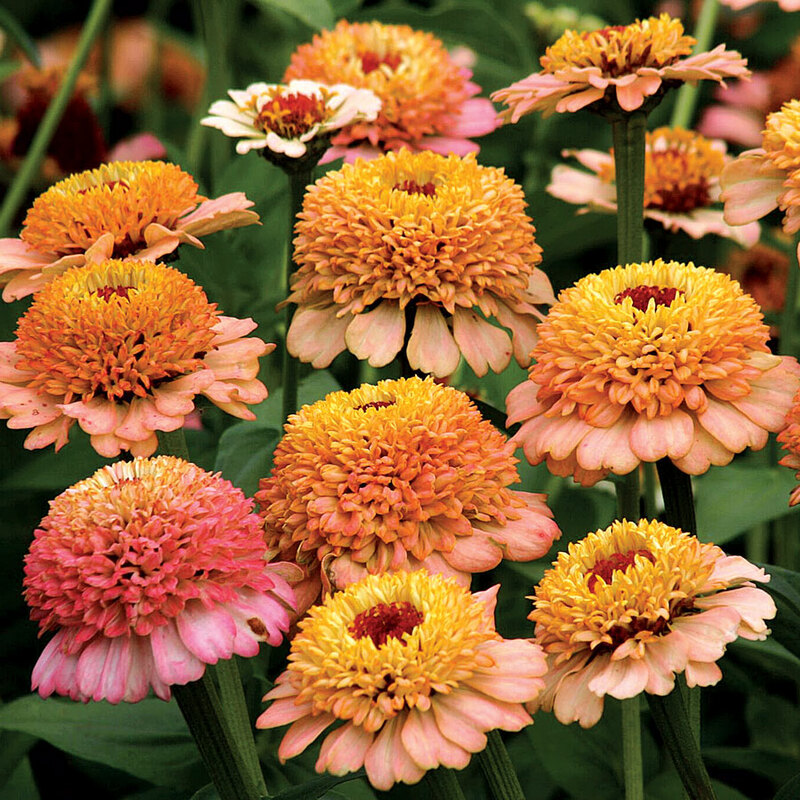 Look for full, robust plants free of insect or disease damage. Choose ones with few flowers but lots of buds. This will give you the longest bloom period. If you haven't already ordered spring-blooming bulbs, now's the time. 5. Sow seeds of lettuce, spinach and other fast-growing greens for fall salads. Continue harvesting vegetables and herbs so they keep producing. Dry or freeze herbs for winter use. 6. Keep up with weeding. Be sure to pull weeds before they go to seed, and dig out tap-rooted weeds such as dandelion and thistle. Disturbing the soil can expose weed seeds to light, which prompts some types to germinate. Add more mulch to planting beds to keep seeds from sprouting. 7. Start dividing and planting. 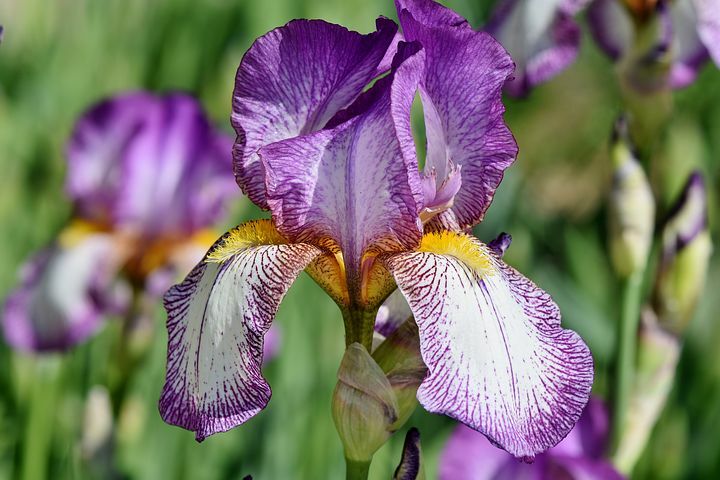 If temps are cool enough, start dividing perennials such as bearded iris and astilbe, and transplanting those perennials, trees and shrubs that acclimate better in fall. Don't move or divide anything while in bloom; it's too stressful for the plant. 8. Check for dead wood. If you live where there's the potential for hurricanes or severe windstorms, look for dead, dying or diseased limbs on your trees. Remove these now so they don't become hazards in a storm. After heavy, soil-saturating rains, check around shallow-rooted trees such as pines (and evergreens in general) to be sure they remain anchored and aren't at risk of toppling. 9. 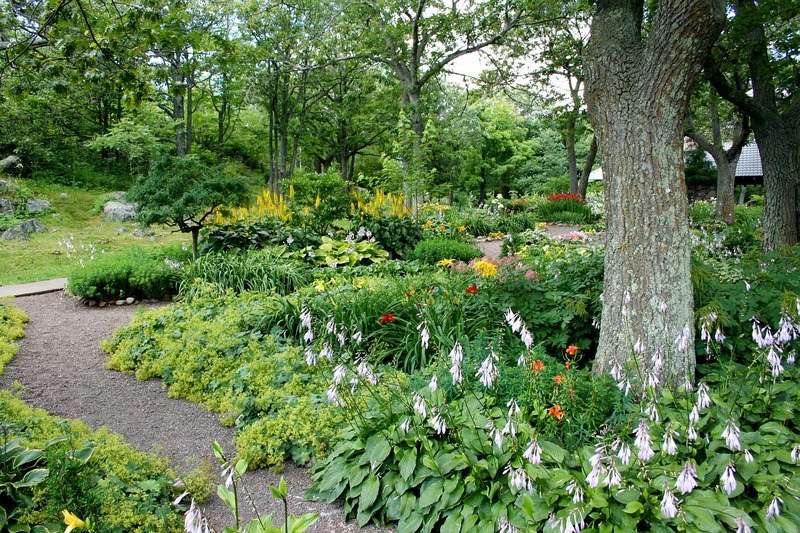 Take photos to remind you where the gaps are in your garden; where it might need a shot of color, height, or texture. Taking photos every few weeks in the different seasons helps you see what needs to be divided, moved or taken out entirely. Photograph your containers, too. Seeing your garden through the seasons will give you new ideas and help you choose which plants to add. 10. Keep your yard mosquito-free. Empty anything that can hold water, no matter how shallow, and give it a good scrub. According to the Centers for Disease Control and Prevention, the mosquito that carries the Zika virus prefers to lay its eggs on manmade containers. The eggs stick to the walls of the container and can live up to eight months even after drying out, so it's important to not only empty containers, but to clean them as well. Anything that collects water should be emptied frequently (at least once a week), kept turned upside down, or removed altogether.